Indeed this is the year Pirates fans have long been waiting for; they have had 20 consecutive losing seasons dating back to 1993. The world of sports is a roller coaster ride filled with passionate fervor, emotions, championships, and crushing defeats. Sometimes it’s great to be a fan, and other times you just shake your head and accept bitter losses. Sometimes the pain of rooting for a team can be so bad that you just give up and leave the bandwagon (guilty as charged). But the pain and struggle of rooting for a losing team is all part of the journey of being a fan. For some dedicated people, the struggle can last years, decades, or even a century (Cubs fans, I’m looking at you). But there’s a special form of character and humility to be earned from years of losing. Look at the Pittsburgh Pirates. The last time they made the playoffs was 1992, when Barry Bonds won the MVP as a Pirates outfielder and Jim Leyland led the Bucs. Since ’92, the Pirates have had 20 losing seasons, finishing in last place nine times and losing 100 games twice. You could say fans in the Steel City have had a rough time recently. Some fans, like 19 year old Pittsburgh native Patrick Dudiak, have never seen their beloved Pirates make the playoffs, much less have a winning record. Pat recently wrote ESPN’s Jerry Crasnick about the dignity and privilege of being a dedicated fan, and I wish to share his profound insights with you. I am one of those babies going of to college Van Slyke is referring to. But, the Pirates didn’t lose me. While it has certainly been a rough ride, and I am still waiting to see my first winning season (4 wins to go! ), there are many in that generation Van Slyke feels like the Pirates lost that are still around. Well, after 20 years of being on this earth, and 20 years of losing baseball, we’re still here. Sports, and especially baseball, have a very special place in the hearts of Pittsburghers, and while it certainly stung every year to know that we would be dumping our top players or prospects at the deadline, we continued to show up. Now, it feels as though our dues are being paid, thanks to Clint Hurdle, Andrew McCutchen, Pedro Alvarez, and the hometown hero, Neil Walker. When asked why I continue to root for such a historically bad team, my answer, like many others, was that because once we break that streak, it will feel oh so good. Well, in 4 games, it will feel…pretty good. But its what lies beyond that, that has us in this generation excited. The Pirates are currently 79-57, tied for first place in the NL Central Division. For the first time in his life, Pat will see a winning Pirates team in 2013. 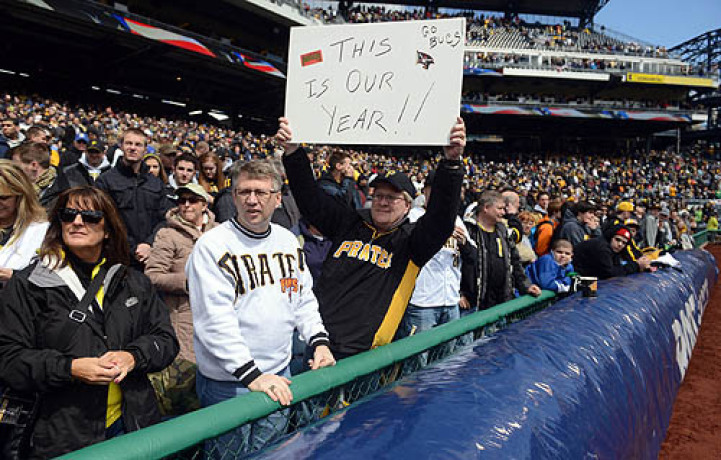 And I hope the Pirates make the World Series this year, because its only fair for diehard fans like him to celebrate. It’s just one example of the sweet satisfaction of being a sports fan. Former Jazz forward Al Jefferson signed a three year contract with the Charlotte Bobcats. This post brought to you by FanDuel. Since the beginning of free agency, big men around the NBA have seemingly always enjoyed huge paydays even if their production seemed underwhelming. From Jim McIlvaine to Jon Koncak, nearly every team in the league at one point or another has made a puzzling move. In 2013, a few have already been made, with more probably on the way. Here is a look at the three major big man free agent signings have gone so far (sans Dwight Howard). Thought of as the best big man out there besides Dwight Howard, the Charlotte Bobcats threw a three year, $41 million contract at him to help try and turn around one of the worst franchises in the NBA. While the Bobcats will be a bit better with Jefferson inside, bad teams in the NBA don’t rebuild this way. With young talent such as Bismack Biyombo, Byron Mullens (if they bring him back) and rookie Cody Zeller, Jefferson will be blocking them from valuable playing time. Jefferson’s deal will eat up a lot of cap room, and that’s bad news when a team that struggled defensively is now paying for a center who struggles defensively. For casual NBA fans who tuned into the Finals, they had to chuckle when they heard Tiago Splitter signed a four year, $36 million deal. Despite being downright dreadful in the NBA Finals, Splitter actually had a solid 2012-2013 campaign with respectable fantasy basketball stats. San Antonio’s core is not getting any younger, and thanks to Manu Ginobili signing for a cheaper deal for the next few seasons, it appears as though the Spurs want to give this core two more chances to win a title. Splitter is never going to be a go-to, standout type of player in the NBA. 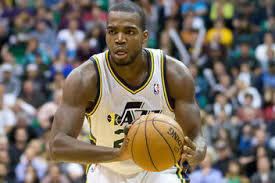 However, he is a dependable two-way player that fits into San Antonio’s system well. He might be overpaid, but they would have had to pay that price or even more to get a replacement. At 32 years of age, signing any injury-prone big man to a three year deal is a bit of a risk. The Indiana Pacers have to feel confident that West can still provide value though, and his style of play indicates that he can. West has a great midrange jump shot, and he has never relied much on athleticism. The Pacers, much like the Spurs, wanted to keep their team mostly intact, so this deal makes sense. He might be a bad contract in the final year of his three year, $36 million deal, but the Pacers are hoping that he can help them in the next two get by the Heat and into the NBA Finals. Everyone knows the Celtics are starting their rebuilding process going into the 2013-14 NBA season. They traded away their two franchise stats in Kevin Garnett and Paul Pierce, along Jason Terry to the Brooklyn Nets in exchange for Gerald Wallace (with 3 years $30 million left on his contract), Kris Humphries, Marshon Brooks, Keith Bogans and 3 first round picks in 2014, 2016, and 2018. From the outside, it looks as though the Celtics are starting from scratch. However, take a closer look at this team. Ask yourself: Do you see the Celtics losing enough to have a chance to get a lottery pick or even Jabari Parker or Andrew Wiggins in next year’s draft? The Celtics are still without a coach at the moment. I am not so sure that this team won’t be able to get to the playoffs, yet alone make a run in the playoffs even without the likes of Pierce, Garnett and Doc Rivers. You might read articles talking about the rebuilding process and how next season is already lost, but you have to motivate your players to play the right way for the full 82 game season. Again, I am not so sure that the players on the current roster will believe that. I know they still think they can win. The Celtics got draft picks, which is what they wanted, but they also cleared cap space to even sign a marquee free agent, like a Josh Smith, Paul Milsap, or even Al Jefferson. The Celtics have a very interesting team coming into this year and if they sign a coach like Lionel Hollins, I won’t be surprised if this year’s team does just as well as last year’s. With Hollins as a coach, this team will play strong, hard defense. This team will be one of the better defensive teams in the NBA, especially with Avery Bradley, one of the NBA’s elite defenders. If Rajon Rondo comes back to his form from two years ago, he can be that elite point guard. He is the player who the Celtics are building around for the future. Pair that back court together, with Courtney Lee coming off the bench and you have one of the best if not the best defensive backcourt in the league. Let’s say the Celtics sign Hollins and sign Josh Smith. This team would be a fun athletic team to watch. With Jared Sullinger, Smith, Jeff Green, Bradley and Rondo, Boston would have a strong defensive unit that would be able to get up and down the court. The Celtics would transition to an athletic defensive minded team that would mainly be able to score in transition from easy baskets. Coming off the bench, Brandon Bass and Marshon Brooks will actually play defense under Hollins. Combine him with Kelly Olynyk, the Celtics first round draft pick, and you have guys who can stretch the floor that will thrive under this system. Again this is just one possibility, and there is only one guarantee I have for this year’s Celtics team: this team will be fun to watch. 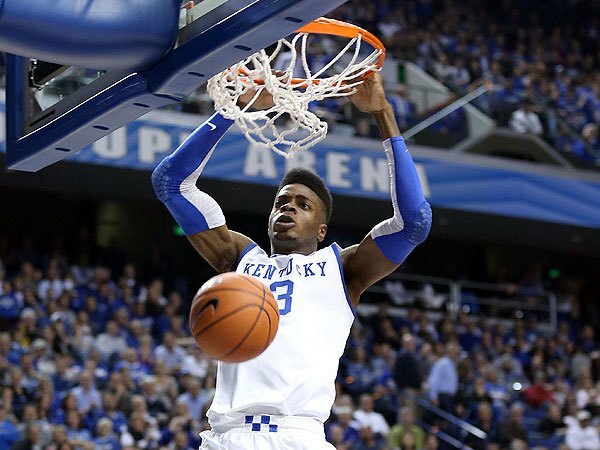 Kentucky’s Nerlens Noel will hope to be the strong big man the 76ers have long needed. It appears the new-look Philadelphia 76ers are getting another makeover. Philadelphia announced they would trade point guard Jrue Holiday to the New Orleans Pelicans for center Nerlens Noel and a 2014 top-5 draft pick, whom the Pelicans selected with the 6th overall pick in the 2013 NBA Draft. Holiday was the unquestioned leader of the 76ers last season, averaging a career high 17.7 points and 8.0 assists per game and earning his first All-Star selection. Holiday, who turned 23 on June 12th, was selected 17th ovrall in the 2009 NBA Draft. He recently signed a four year, $41 million extension with Philadelphia. In return, the 76ers receive former University of Kentucky center Nerlens Noel, whom we projected to be the #1 overall pick in tonight’s NBA Draft. Instead, Noel fell to New Orleans at the sixth pick. Noel is the big, physical center the 76ers have long needed. Last year, they traded superstar Andre Igoudala away to acquire Lakers center Andrew Bynum. 82 games and $16.9 million dollars later, Bynum will likely leave Philadelphia without playing a single minute (he struggled to recover from offseason knee surgery and treatment). Philadelphia will also receive a first round draft pick in 2014 that is guaranteed to be a top 5 pick. The trade of Holiday opened up the point guard role in Philadelphia, so new GM Sam Hinkie used the 76ers’ 11th pick in the NBA Draft to select Syracuse PG Michael-Carter Williams (ranked #8 on our big board). Carter-Williams and Noel represent a new class of young talent in Philadelphia (Williams is 21, and Noel is 19). With the additions of the two young talents, the 76ers have a projected starting lineup of Carter-Williams, Nick Young, Evan Turner, Thaddeus Young, and Noel. Last year, Noel and Carter-Williams combined for 22.6 points, 14.4 rebounds, and 9.0 assists per game. The 2013 NBA Draft is quickly approaching and sixty of the world’s best basketball prospects will hear their names called on Thursday night. Whereas past drafts have had clear-cut favorites to be selected #1 overall, this year’s draft class is very balanced, and many experts differ on who will be taken first by the Cleveland Cavaliers (or if the Cavs will even use their first pick). Here are the top ten players who should come off the board first in the 2013 NBA Draft. 10. Shabazz Muhammad, SF, UCLA, 6’6″, 220 lbs. Muhammad was the most highly regarded high school prospect in the Class of 2012, and expectations were high when Muhammad arrived in Los Angeles to play for the UCLA Bruins. But an NCAA investigation into Muhammad’s recruiting days found evidence of improper benefits, and the UCLA star was suspended before the season even began. Muhammad returned to the Bruins and was a solid player (17.9 points, 5.2 rebounds), but wasn’t the flashy star everyone thought he would be. Muhammad will still be good, but needs to improve his defense and outside shooting to be a true offensive threat. 9. Cody Zeller, PF, Indiana, 7’0″, 230 lbs. Like his brother Tyler Zeller (Cavaliers), Cody is a standout in the low post who has plenty of mobility as well. Zeller is also highly praised by scouts and coaches for his high basketball IQ and unselfish team-first attitude. He will be a good scorer and rebounder in the NBA, but might need to get a bit stronger to match up with the league’s best big men. Still, the 2013 Second Team All-American will make a solid NBA player and could start within a year or two. 8. Michael Carter-Williams, SG, Syracuse, 6’6″, 184 lbs. Carter-Williams showed his leadership potential during Syracuse’s run to the 2013 Final Four, and though his 12.1 points per game weren’t earth shattering, he also added 7.2 assists per contest. He is probably more suited to be a point guard and has better skills as a floor leader and playmaker than a scorer or pure shooter, but Carter-Williams will be a valuable asset to any team that drafts him. 7. Alex Len, C, Maryland, 7’1″, 255 lbs. Len is the most “experienced” player in the 2013 NBA Draft class; he played a season of professional basketball in his native Ukraine before attending the University of Maryland. Len is a big, strong post player who is one of the best forwards in this draft class. He showed offensive scoring prowess at Maryland, and has held prominent post players in check defensively. He isn’t the most athletic or mobile player, and he recently underwent ankle surgery in May, which will keep him sidelined until September. 6. Anthony Bennett, SF, UNLV, 6’7″, 239 lbs. Bennett is a bit of a Swiss Army knife player; he can do a little bit of everything on the court. An adept rebounder and post player, Bennett is also highly effective as a shooter. This fits well into most NBA systems, because Bennett can play in both a pick-and-roll and pick-and-pop offensive system. One of the most well-rounded prospects in the draft, Bennett will fit in as a small forward or power forward. 5. Ben McLemore, SG, Kansas, 6’5″, 189 lbs. McLemore stormed into the spotlight in the 2012-13 NCAA season with the Jayhawks, earning Consensus Second Team All-America honors and being nominated for the Wooden Award. McLemore is known best for his shooting ability, garnering comparisons to NBA great Ray Allen. He shot greater than 50% from the field, and that makes McLemore an attractive prospect worth a top 5 pick. 4. Victor Oladipo, SG, Indiana, 6’4″, 213 lbs. I believe very strongly in Victor Oladipo’s ability to become a star player in the NBA. He has all the tools for success, especially on the defensive side of the ball. He earned National Defensive Player of the Year honors last year and was a First Team All-American, scoring 13.7 points on 61% shooting. Some scouts have compared his skillset to those of Dwayne Wade and Michael Jordan. An aggressive and smart player, Oladipo is sure to be a top 5 selection on Thursday. 3. Trey Burke, PG, Michigan, 6’1″, 187 lbs. The reigning Naismith College Player of the Year is a lock for a top 5 selection in the 2013 NBA Draft. Burke was a true leader for the Michigan Wolverines, leading them to a #1 ranking and a National Championship Game appearance in 2013. He displayed elite shooting skills and lockdown defensive talents, yet some scouts doubt his ability to be an NBA superstar. After a strong NBA Combine performance, however, Burke proved he belongs among the draft’s best players. 2. Otto Porter Jr., SF, Georgetown, 6’9″, 200 lbs. Porter greatly improved from an already impressive freshman year at Georgetown, scoring 16.2 points per game last season. Many scouts love the intangible skills of Porter, most notably his athleticism, movement away from the ball, and high level of court awareness. College coach John Thompson III called Porter “the most prepared freshman I’ve ever coached”, and Porter’s skills only increased in 2013. He will be a physical, athletic player in the NBA, and will be a prime target for several teams that draft early. 1. Nerlens Noel, C, Kentucky, 6’11”, 206 lbs. When you think of Nerlens Noel, his hi-top fade hairstyle might be the first thing that pops into your mind. But Noel is also an extremely gifted basketball player who didn’t have a chance to fully showcase his talents last season. A torn ACL in a February 12 game against Florida sidelined Noel for the remainder of the season, but he proved he is a versatile, dynamic player (10.5 points, 9.5 rebounds in 24 games). He might be a bit of a risk with a history of injury (see: Greg Oden), but Noel is still the purest talent in the 2013 NBA Draft. 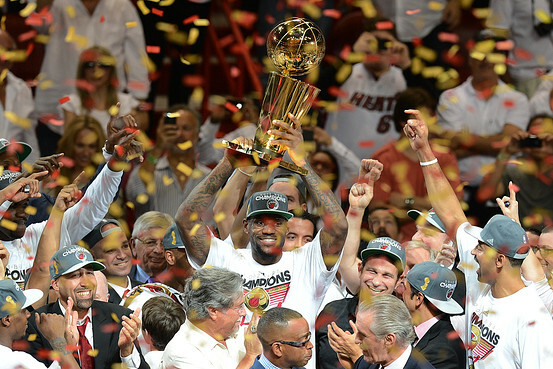 The 2013 NBA Finals could be summarized all with a few words: team basketball, unselfish play, and to finally, dynasty. Throughout the twists and turns of the season, the San Antonio Spurs were written off as old and that their time to compete for championships were over. The West was supposed to be taken over by the flashy teams in LA and the Thunder were the favorites to reach the NBA Finals. The San Antonio Spurs have done it their way since their dynasty began in the mid to late 90’s. It has always been unselfish team first basketball. The Spurs have been sticking to their philosophy and as the era officially comes to an end they have a 4-1 record in the finals. Throughout the series against the Miami Heat, this team effort has been shown, from the head coach all the way down to the 12th man on the bench. This era has never been about flashy players, major contracts ,or proclaiming how many rings that this small market team would win. San Antonio finds the players who play the right way and will play as a team. Being a fan of the most boring team in sports, it has been a thrill and bittersweet to see this era come to an end the way it did. The Spurs pushed and pushed and pushed as much as they possibly could but in the end it wasn’t good enough. It has been remarkable to watch San Antonio win four championships and hold the highest amount of class any team or organization could possibly have. It was even shown with the gratitude and class shown when congratulating the Heat on their championship tonight. I can honestly say that as much as this team did not go out on top, they went out with class. Every good dynasty or empire eventually falls. Some wrote of the San Antonio dynasty years ago and some think that it is now finally over. With this dynasty being officially over the bright news that remains is their great young talent. The development that the spurs have builds championships. There still is light at the end of the tunnel; however, that tunnel is bright for a new regime to take over. This era has been humbling and an amazing feat to watch. 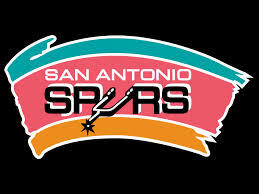 Congratulations to the Miami Heat for winning but thank you San Antonio for one hell of a run and era. LeBron James and the Miami Heat are looking for their second consecutive NBA Championship. The 2013 NBA Finals are finally upon us, and the San Antonio Spurs are seeking their fifth NBA title, while the Miami Heat are looking to repeat as NBA Champions and win their third title. Before the series begins on Thursday night, we examine each team and their chances of winning the NBA Championship in 2013. The Heat are back to the NBA Finals for the third straight year, led once again by LeBron James, who is averaging more than 25 points per game in the playoffs. They coasted through the first two rounds of the playoffs before getting a tough, seven game series with the Pacers. The Heat looked pretty hit or miss in the Eastern Conference Finals; when they were on their game, they won games easily, but they also struggled to defend the low post presence of the Pacers. Chris Bosh and Dwayne Wade also struggled some in the Conference Finals, but the Heat’s Big 3 should be more than ready to compete against the Spurs. Miami defeated San Antonio in both of their regular season matchups. The Spurs are right back at home in the NBA Finals, where they have won four championships in four appearances. They also cruised through the playoffs, sweeping two series with just a slight bump in the road against the formidable Warriors. Tony Parker has been red-hot for the Spurs in the playoffs, and Tim Duncan continues to show why he is one of the greatest power forwards in NBA history. Still, there are some questions for the Spurs. Can they defeat the Heat this season (after losing both regular season games)? Can Tim Duncan be as effective as Roy Hibbert against Miami’s frontcourt? Will the Spurs’ long layoff hurt their momentum? Even with these many questions, the Spurs are as sound a team from coach to 12th man as any in the NBA.